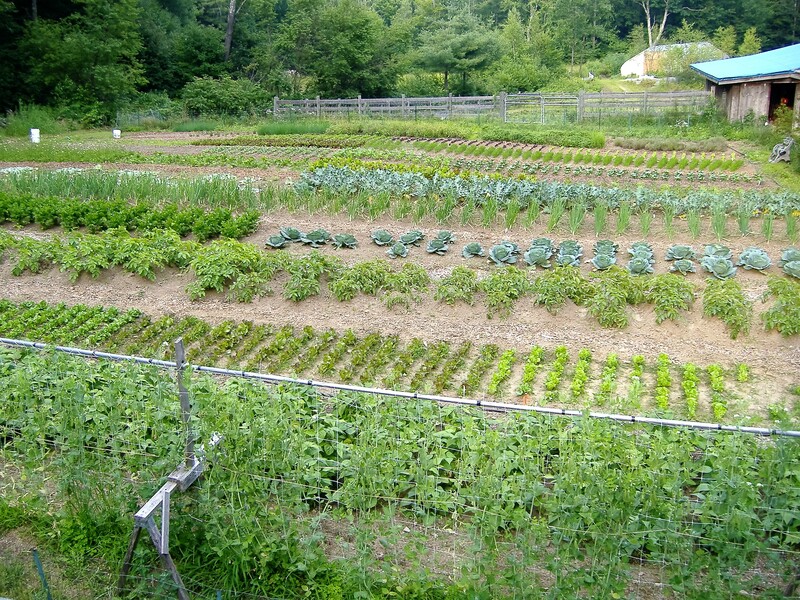 Our CSA members receive a wide variety of vegetables, fruits, herbs, sprouts, and honey all produced here on our 13-acre farm in west Deerfield. We bought our wooded lot in 1993, and then harvested and milled trees to construct our buildings and fencing. We have slowly reclaimed the old fields by improving the soil through the use of continuous cover cropping, and the addition of slow-release mineral nutrients, and compost, produced here on the farm. Our soils are now very fertile. We use numerous environment-modifying techniques including: ground mulches, crop covers, drip-irrigation, shade cloth and low and high tunnels, to provide protection from crop pests and diseases, and to provide for an extended harvest period. numerous varieties of: leafy greens, peppers and tomatoes, cruciferous crops, squashes, roots and tubers, peas and beans, and more. Our season usually runs 21 weeks, starting the first week of June. Everything we grow is equally shared among our CSA member families. We utilize strict, post-harvest handling procedures for all our products. They are hydro-cooled, washed and refrigerated where necessary. Each week's harvest is divided up, bagged or bundled, and ready to be picked up during our long pick-up hours. Members receive enough product for two adults and two children. Members pick up their bounty anytime Friday from 8 AM to 5 PM, or Saturday 8 AM to noon. "